The Wellbeing Programme is a philanthropic initiative by Friends of Tibet, a non-profit service organisation founded in Mumbai in 1999 to support the cause of Tibet and to create awareness about the issue of Tibet amongst people all over the world. This initiative is researched, designed and implemented by Friends of Tibet members, volunteers and the beneficiaries of the Wellbeing Programme. Friends of Tibet Foundation for the Wellbeing aims at the restoration, propagation and promotion of the endangered traditions and practices of Tibet. A fast paced world, where we can achieve our tasks with the touch of our finger tips. A world where there is so much going on that we lose ourselves if we are not careful. A world ridden by plastics and toxins which we embrace in our daily life oftentimes even in full awareness of its effects. It is a world where we need help just to be well. We all just aspire to be truly healthy and happy. The Friends of Tibet Wellbeing camp, organised and conducted quietly and regularly by a few dedicated individuals, contributes so much to the mental, spiritual and physical health in ways which people in this part of the world hardly expect. As another camp concludes, many leave in better states of mental and physical health with the hope and promise of a higher quality of life awaiting them. While the Wellbeing program has its healing methods and medicines rooted in ancient wisdom they still understand the needs and tendencies of the contemporary society. This edition of the Wellbeing report is dedicated to some of our contributors whose hard work and creativity made it possible to make our camps better in terms of service and accessibility to all those who came from near and far to be a part of it. A complete online system has been developed and now registration is possible through our own Mobile App. An image identity has been developed and we took another step towards our goal of being more friendly to our natural environment. That said I would like to highlight the people behind these advancements. 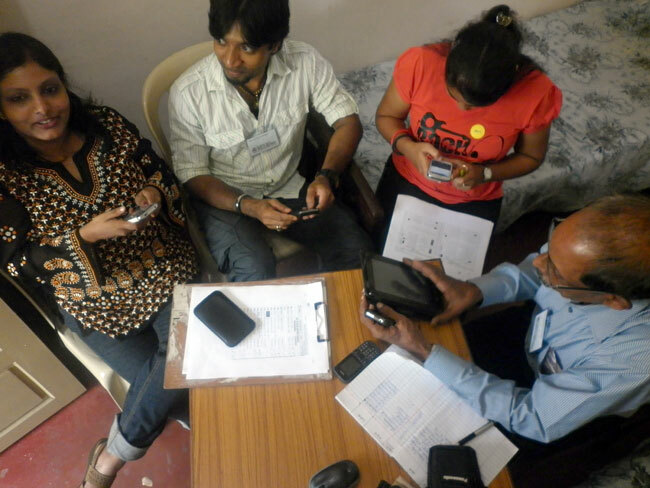 Bharat Parikh and Bhushan Pradhan of ThoughtShastra Solutions, Mumbai got involved with the Wellbeing programme and were kind enough to offer their skills and technical knowledge to create a mobile application which has without doubt simplified and eased up the processes of registration and organisation. 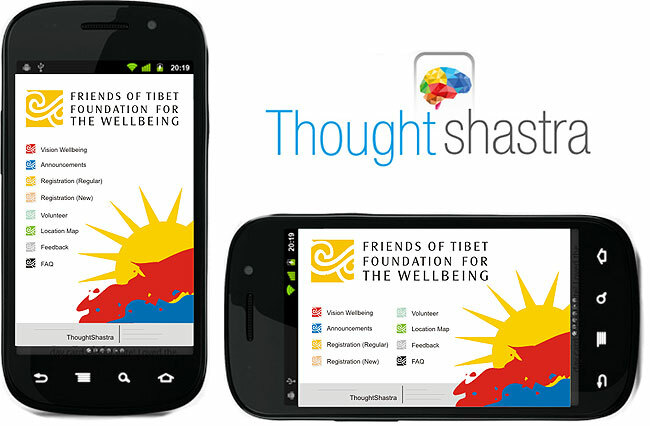 ThoughtShastra is a fast growing mobile application company that was created with the singular focus of bridging the "consumer-mobility" divide. As the number of smartphones hitting the market multiplies exponentially, it is essential for any and every organisation to have a "mobile-face" for its consumers. ThoughtShastra's sole endeavour is to help bridge this gap. 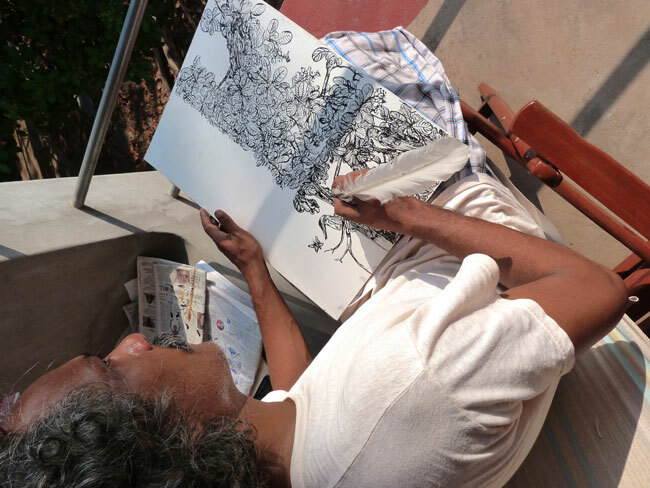 ThoughtShastra is a self-funded start-up and is backed with relevant experience spanning more than 37 man years. Its flagship offering "MobiEdge" is targeted towards the "Education" sector and aims at providing a better "Learning Experience". When asked about their experiences with the "Friend of Tibet Foundation for the Wellbeing", they were quick to respond and sincere in their intentions. 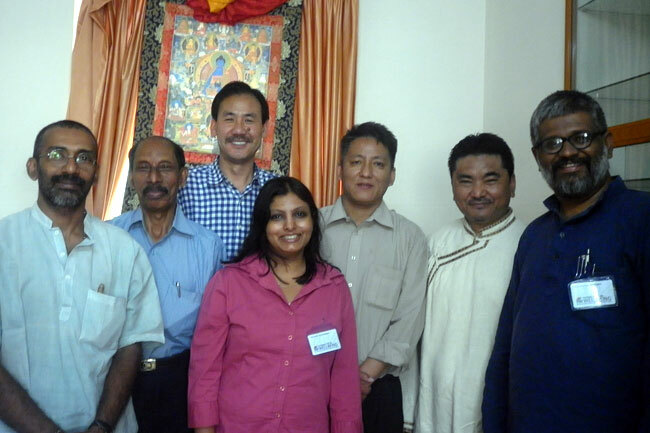 This is what they had to say: "We are extremely enthused at being connected with the Friends of Tibet Wellbeing programme and are happy that the ancient Tibetan Medical Tradition can benefit patients here in India. We are looking at doing our bit by creating a mobile app that 'simplifies life' for the people connected with this programme. The Wellbeing Mobile App aims at giving the end users 'Convenience" while at the same time, giving the Organisers better 'Control' and the overall program a constant 'Connect' with its users." PaperTrail is a non-profit organisation run by Diwia Thomas, with truly genuine intentions towards the environment and humanity itself. Based in Kochi, they work with women of all age groups and socio-economic backgrounds and motivate them to be empowered while providing the means to support themselves and their families. Donated newspapers are converted to paper bags which can be used multiple times before it falls apart which in effect saves the environment from that many plastic bags. They have diversified into bags and accessories with hand-made paper and work along with differentially abled children as well. She became a part of the programme when the strict no plastic policy of Friends of Tibet drove the organisers to find an individual who could supply a practical alternative. She is an amazing young woman of much initiative and dedication. 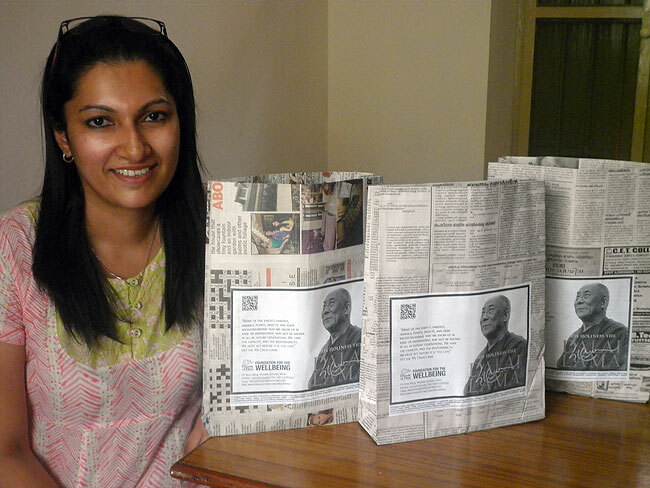 Her movement, which employ hundreds of women, now runs on 'autopilot' as they produce about 4000 paper bags a month and supply to various organisations and brands. Diwia is frank about her intentions and comes through as easy going and genuine while she explains that she has been supplying the Wellbeing camps with paper bags ever since its inception. Her commitment to the people she works with and the larger cause she truly believes in is truly inspiring. The Wellbeing image identity was created by Alexander Devasia whose relationship with nature and his own spirit is holistic and untainted. He connects to his soul and has a deep respect for nature and hence proved to be the perfect person to create the image identity of the Wellbeing programme. "Wellbeing means a healthy nature! When I am sitting on my veranda surrounded by nature drawing everything that surrounds me  in the East the two blossoming cashew nut trees with yellow and red fruits, in the West the garden with the lotus pond and biotope  I forget myself and become one with this beauty. Humans can hunt and go fishing, harvest the fields and control the world. 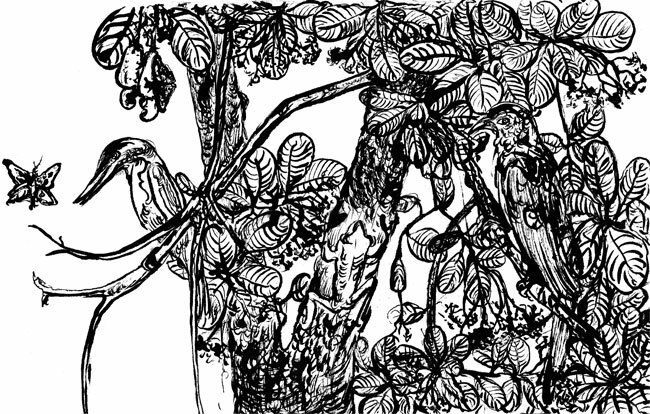 As more modern life goes on, we forget about keeping a space alone for the nature as our ancestors in Kerala did with a "kavu" near the house or the village. Everything could co-exist there  creatures and plants which were not of much use for the people, trees and creepers without tasty fruits or animals like snakes, beetles and mosquitoes... The Kavu was the spiritual corner of the place where people lived. They must have understood that their life without nature would not be possible. I cannot think to live without nature around me, without all this variety of beings  I am a part of it. I share my life with these birds, butterflies, fish, frogs and turtles in the pond, the two squirrels on the roof, three wild cats in the garden and all the different trees  I am not getting tired of drawing the character of their leaves and blossoms... And every morning when I see everything in the light of sunrise again and again, I receive my first medicine of the day by inhaling the power of nature. She is the mother of all life, in health I will enjoy wellbeing for soul and body." There was a time when the Wellbeing camp was a small event and volunteers would carry the paper registration forms even when they travel. 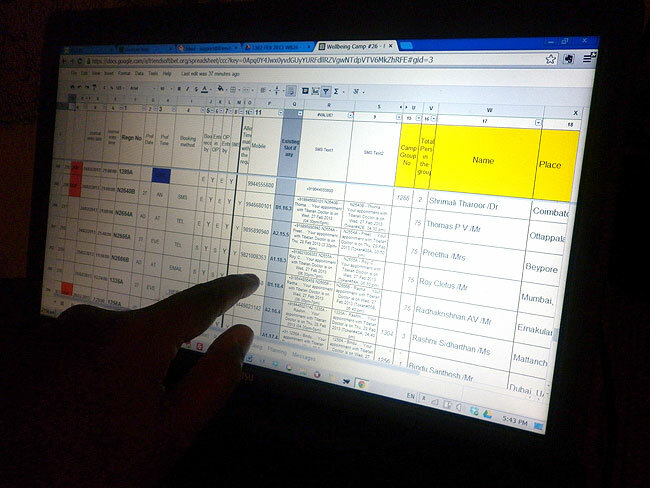 Back then these details were shared with other volunteers via SMS. As the popularity of the camps increased and more and more people started attending, this system fast became unfeasible. Yeldtho Mathew, a man of true dedication took it upon himself to create the Wellbeing Online System, which revolutionised the way these camps are planned and organised. He created this tool in his free time and relentlessly insists on perfection and keeps updating it ever so often. Today we have a well-developed online system which is also our database that enables Friends of Tibet Volunteers and Doctors from Men-Tsee-Khang, the Tibetan Medical and Astrological Institute of His Holiness the Dalai Lama to plan and monitor appointments and document medical reports regularly. The online application automatically prepares short messages with consultation date and time to be sent across to thousands of participants. The Wellbeing Online System has completely changed the way the Wellbeing volunteers work. Today the volunteers spend less entering data while they are able to spend their quality time on working on other areas of the programme. 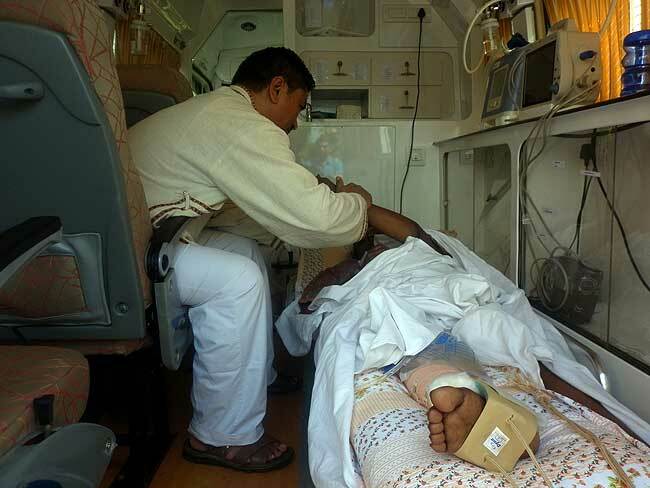 (TOP) Dr Dorjee Rapten Neshar checks a patient inside an ambulance during the 26th Wellbeing camp organised jointly by Friends of Tibet Foundation for the Wellbeing and Men-Tsee-Khang from Feb 27-Mar 2, 2013.